ES UNA AGRUPACIÓN, CON CARACTERISTICAS MUY PARTICULARES, YA QUE SU OBJETIVO ESPECIFICO, ES EL BAILADOR, ASI COMO SUENA, YA QUE SU CONCEPCION COMO TAL, ES RENDIRLE TRIBUTO A ESTE, ES PONER DE MANIFIESTO, EL SENTIDO RITMICO Y ARMONIOSO, DE NUESTRAS RAICES AFROLATINAS, ATRAVES DE LA INTERPRETACIÓN, DE UNA VARIEDAD DE RITMOS CADENCIOSOS, DONDE QUEDA MANIFESTADO, EL CONCEPTO Y LA IDEOSINCRASIA DEL MUSICO VENEZOLANO, SU MENSAJE A TRAVES DE LA EJECUSION DEL INSTRUMENTO Y EL FILING QUE ESTE TRANSMITE A LA HORA DE RENDIRLE ESE MERECIDO TRIBUTO A NUESTRO PUBLICO Y MUY PARTICULARMENTE AL RUMBERO, AL BAILADOR. POR OTRA PARTE; CABE DESTACAR, QUE MUCHO MAS ALLA, DE ESTE TRIBUTO AL BAILADOR, LA ORQUESTA, BUSCA ENVIAR UN MENSAJE, LLENO DE ALEGRIA Y ARMONIA A TODOS LOS CORAZONES QUE SE ABREN PARA DISFRUTAR Y DELEITARSE DE ESTE SWING A LO PALO MAYOR. ESTA AGRUPACION COMO TAL, YA SE ENCUENTRA REGISTRADA LEGALMENTE, CON EL NOMBRE: PALO MAYOR MI SON C.A. ; RIF: J-296011389 ANTE LAS INSTITUCIONES QUE LES COMPETEN, DICHO REGISTRO Y LOS TEMAS INEDITOS QUE ESTA INTERPRETARA, EN UN FUTURO A CORTO PLAZO, YA QUE ESTAN EN PROCESO DE GRABACÓN, ESTAN REGISTRADOS IGUALMENTE Y SON DE LA AUTORIA DE SU DIRECTOR GENERAL Y TUMBADORAS. EDUARDO AMUNDARAIN CON ARREGLOS DEL PROFESOR TUKY TORRES. CABE DESTACAR QUE EL PRODUCTOR GENERAL Y MUSICAL DE ESTA OBRA, EN HOMENAJE AL BAILADOR ES SU DIRECTOR GENERAL, EDUARDO AMUNDARAIN, Y EL CO-PRODUCTOR Y ARREGLISTA DE TODAS LAS VERSIONES Y TEMAS INEDITOS ES EL PROFESOR TUKY TORRES. POR OTRA PARTE, LA GRABACION DE TODAS LAS VERSIONES Y TEMAS INEDITOS, SE ESTAN REALIZANDO EN EL ESTUDIO DE GRABACION: PRODUCCIONES ALONSO 12, A CARGO DE MARLON ARAUJO, EL CUAL ES EL INGENIERO DE SONIDO DEL MISMO Y EL CUAL NOS ESTA ASESORANDO TAMBIEN EN ESTA OBRA MUSICAL. EL REPERTORIO, QUE INTERPRETA NUESTRA ORQUESTA PALO MAYOR, EN LA ACTUALIDAD, SE CARACTERIZA, POR SER VERSIONES BAILABLES, (CLASICOS) DONDE HAY MUY POCAS DESCARGAS MUSICALES COMO TAL, DONDE LA IMPROVISACION EN ARMONIA CON EL ACOMPAÑAMIENTO, DAN UN TOQUE MUY ESPECIAL, LAS VERSIONES QUE INTERPRETAMOS, EN SU CASI MAYORIA, SON DE LA SONORA PONCEÑA Y LA SALSA MAYOR, TAMBIEN TENEMOS VERSIONADOS TEMAS DE JOSE MANGUAL, RODRIGO MENDOZA Y HERMAN OLIVERAS ENTRE OTROS. ENTRE ALGUNOS DE LOS TEMAS QUE TENEMOS VERSIONADOS SE ENCUENTRAN: CANTO AL AMOR, EL BAILE DEL SUAVITO, TUMBAYAYA, CIEGO DE AMOR, AHORA YO ME RIO, YEYEY, EL POETA, TEMA PARA UN SONERITO, OYE LO QUE TRAIGO, POR QUE SERA, SONAREMOS EL TAMBO, COMO TE QUISE YO, PRENDE EL FOGON, TU Y YO, RAMONA Y UN CONGO ME DIO LA LETRA. ENTRE LOS PROGRAMAS RADIALES, DONDE SE HA ENTREVISTADO A SU DIRECTOR GENERAL, EN REPRESENTACION DE LA ORQUESTA, TENEMOS: PROGRAMA DE ASOCOSALSA, RADIO COMUNITARIA ALI PRIMERA, MODERADOR: CHEO GUEVARA; RITMO, SABOR Y ESTILO, RADIO NACIONAL DE VENEZUELA, MODERADOR: JESUS PRIMERA SANOJA; LA HORA DE LA SALSA, RADIO ARSENAL, MODERADOR: JAVIER EDUARDO ARATIA. ENTRE LAS PAGINAS DE INTERNET DONDE PUEDEN CONSULTAR NUESTRO TRABAJO TENEMOS: BLOG SALSA BRAVA, EL BLOG DE SALSA Y CONTROL. (NEW YORK);SALSA EN BLOQUE. (COLOMBIA); BONGOSTEREO.COM (COLOMBIA); EL BLOG DE SONES Y SONEROS. (PERU); EL BLOG DE FERNADO CATAÑO (PERU); BLOG DE GUASASA LA CULTURA LATINA. (VZLA); BLOG DE SALSA GLOBAL. (COLOMBIA), VENEZUELA ES SALSA. (VZLA); VENEZUELA UN OASIS. (VZLA); ARTISTAS EN DO-MI-SOL. (URUGUAY); AMISALSA Y SALSAENCALI.COM. (COLOMBIA); LATINAZOZ.NET (PERU); RENZEX BORINCUBA. 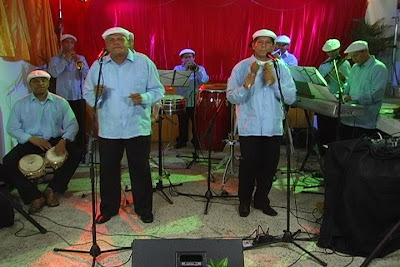 (PERU); SALSA CON LOS PICHY. (COLOMBIA); ESTAMOS EN SALSA. (ESPAÑA); SALSA CON ESTILO TAFUR. (COLOMBIA); A GOZAR LATINO. (COLOMBIA); ORGANIZACIÓN SALSALÉ. (MEXICO); ENTRE OTRAS. PARA CONTACTARNOS PUEDEN HACERLO A TRAVES DE LOS SIGUIENTES No. TELF. 0424-249-83-97 / 0212-682-08-20 / 0212-334-57-94 / 0416-728-48-95; ALONSO PRODUCCIONES: 0212-578-49-25.